Hey there! Thanks for joining me for day two of the Papertrey Ink August countdown. I'm back today to bring you more of my new set... Bubble Talk. This fun new set has lots of possibilities when using it alone or pairing it up with so many other previously released sets. Perfect for framing out one of the sentiments included here or paired up with other sentiments. From the looks of it, it sounds as if some of you are as excited about this set as I am! 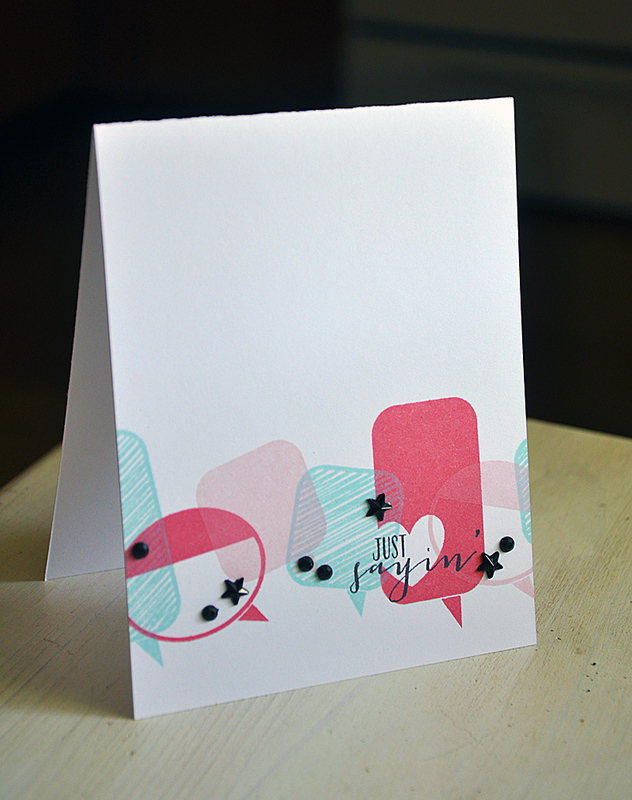 Bubble Talk will be available for purchase through Papertrey Ink, beginning August 15th, for the price of $15. 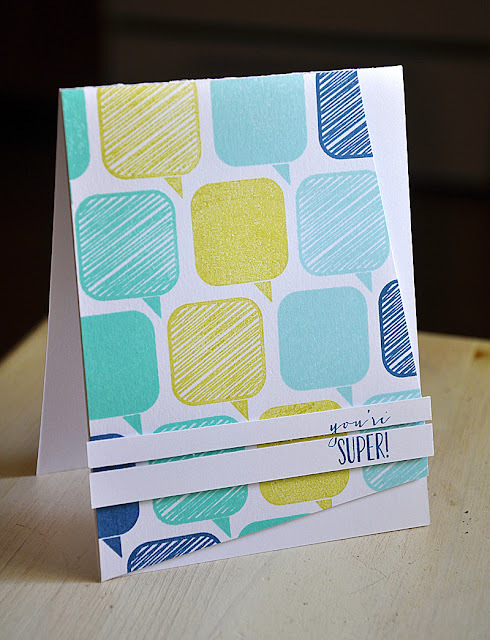 Bubble Talk includes 6 speech bubbles, 4 accent images and 4 sentiments. Coordinating dies will also be available for purchase. 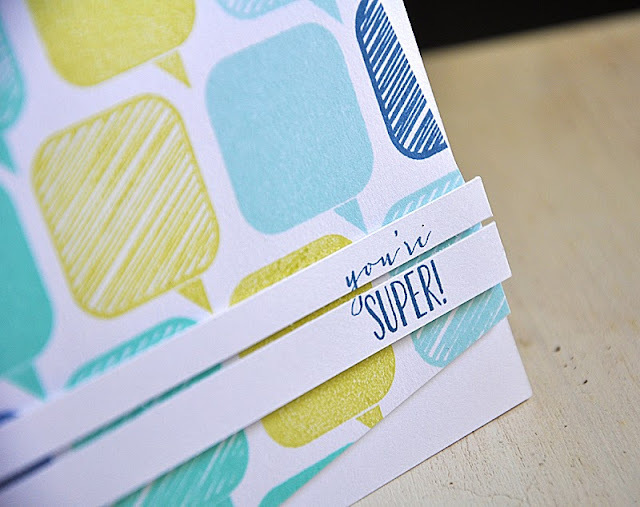 Be sure to stop by Nichole Heady's blog for more samples and a look at the dies. First up, I created a fun row using five of the six speech bubbles included in Bubble Talk. 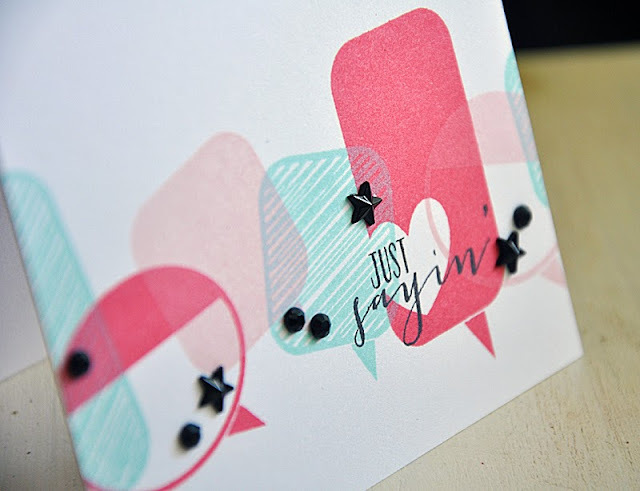 I then finished this one-layer card off with a sentiment (also from Bubble Talk) and an assortment of black rhinestones. I trimmed the bubble panel at an angle and then finished the card off with a sentiment (from Bubble Talk) cut into two strips. With the sentiment cut in two, it kind of gives it an unexpected look. I like it a lot! I'll end today with yet another one-layer card. Like I told you yesterday, this set is great for making such cards! 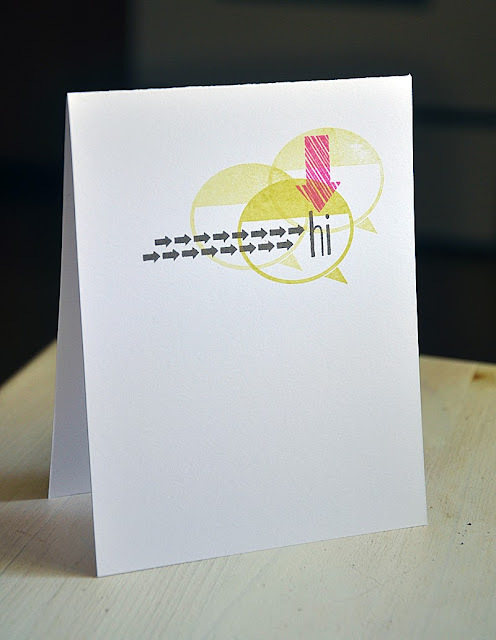 I used a little generational stamping to create the bubble trio, then stamped the sentiment and finished the card off with a few directional arrows to direct the eye to the message. Every image on this card is from Bubble Talk. Well, that concludes today's look at Bubble Talk. Just remember... this stamp set and coordinating dies will be available for purchase through Papertrey Ink, beginning August 15th. In the mean time, I'd love to know what you think, so please feel free to share! Now, be sure to visit Nichole Heady & Melissa Phillips for new peeks. Also, Heather Nichols, Dawn McVey, Melissa Bickford and Erin Lincoln have peeks to share with you of their newest sets for the month. Cool! Love these cards, Maile, and the stamp designs as well! 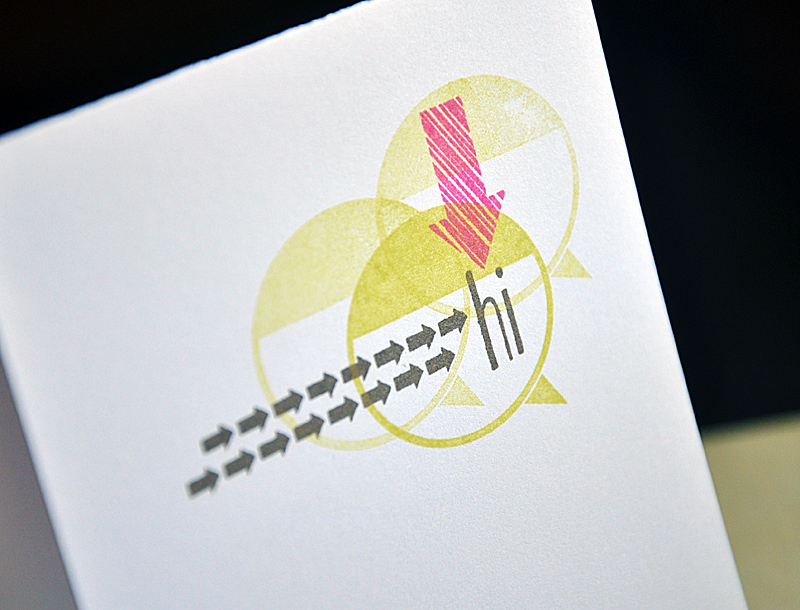 The colors of that first card are so pretty, a bit bubble-gummy, for bubble-talk stamps, hi hi, love it! Thinking these will be a staple in my stash. Fun to use in so many ways! LOVE your designs with this fabulous new set!! So you! Really loving the set. I so love your style! Thanks for the inspiration. Wow wee these are amazing!! I like the bright colors. Love this set!! Thank you so much for your refreshing and clean take on card designs! These are the cutest talk bubbles that would be fun and easy to use - thank you for the inspiration! I love your new set! Really amazing! I've never realized how many cool things you can do with speech bubbles. Great set and I will have to get it. I've been wanting someone to design cutting-edge speech bubbles, and here they are. These are fabulous and I cannot wait to have this set in my hands. I've got so many ideas already! Super cute fun cards all in bubbles and soothing works. very cute. You've done it again--another stamp set I can't live without! Love the Bubble Talk set!